At the March for Life in 2016, the Academy students and staff were able to test their mettle against more than one of the enemies of God. The impending blizzard of January 22nd, which caused so much havoc before and after the march, could have been an act from the devil. 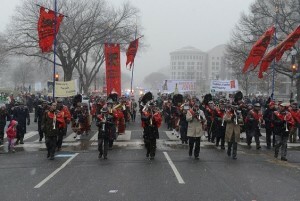 The bad weather reduced the outcome of the March by several thousands, but the Academy was still able to attend. The students welcomed the challenge of having to hand out fliers, play their instruments, and carry the TFP standards and banners with good humor and enthusiasm all the while facing the harsh winds. 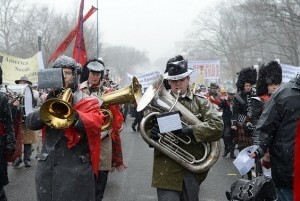 The band was particularly effected by the snow because with snow comes cold weather, and with cold weather comes jammed and frozen valves. The students were fortunately able to rise to the occasion and beat the weather that had beat so many others. 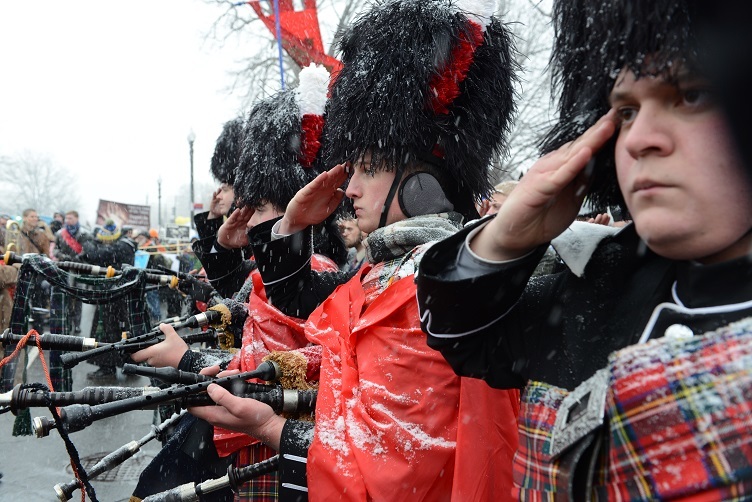 The very thought that they would have to march and play in the snow lifted their spirits more than anything else that day. After about two hours of hard work, the March ended. After the long March the students had one more task to complete. Taking to their instruments one last time, the students played the National Anthem in front of the Supreme Court to remind America’s leaders that America was founded on Christian principles and that nowhere in the Constitution does it say anyone has the right to kill babies.